Where to Find Good Web Hosting in India? Home » Internet » Where to Find Good Web Hosting in India? Web Hosting is a type of service where you can host or upload your website so that it can be accessible on the internet. A web hosting includes various resources like web server, cpu, ram, disk storage, mail server, packages like php, database, ftp etc. Anyone can purchase a hosting account and upload their website, given that you have already registered or have a domain name. Domain name and hosting are the two main things to get your website online. A Domain name is an address of your website i.e www.xyz.com , where xyz is your domain name and .com is the domain extension, it can be .com, .org, .net, .in according to what you need for your website/business as different domain extensions have different implications or purposes. A linux hosting includes a linux based Server or OS (operating system) e.g Centos, RedHat, Fedora etc. and Windows hosting includes Windows Server or OS. Linux Hosting is very popular because of its reliability and speed and also for PHP which most widely used technology / language used in variety of internet websites, applications and open source platforms like wordpress, drupal, joomla etc. requires a Linux Server only. Indian webmasters or website owners especially the new ones generally prefer to buy hosting from Indian hosting companies only because of the following reasons. Payment Options: If you buy hosting from outside India i.e. from US, UK etc. then you have make the payment by Credit Card or by Paypal. In India everyone does not have the credit card and paypal account so they are forced to buy hosting from India where they can get wide range of payments options to choose from like by Netbanking, Debit card, Credit card. Support: If somehow you are facing problems with your hosting account then you can easily call he hosting company on its toll free number by your phone and tell them to rectify the problems. Phone support is also available in hosting outside India but international calls costs a lot and most of the Indian users are also not comfortable in dictating their problems in English. Local Server Advantage: If you have a website mainly for Indian users then the local server (operating in India) can give you the advantage of geographical targeting in search engines and speed as your pages will be served from an Indian server making them faster to load for users in India. There are various (in thousands) web hosting companies in India but most of them are not reliable, lacks good support, lacks server quality, performance and they don’t care about their customers. 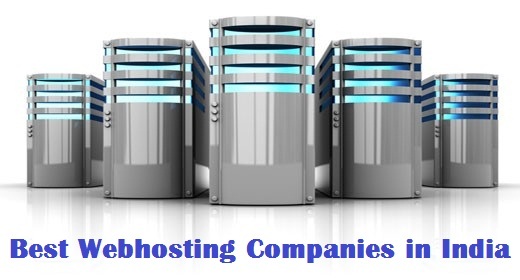 So here are some very reliable web hosting companies in India to choose from. BigRock is an Indian Domain Name Registration and Webhosting company. It offers domain registration and webhosting services that includes shared hosting, vps hosting, and reseller hosting and dedicated hosting. You can pay for their service by netbanking, debit card, credit card, paypal options. Their hosting plans are also quite cheap. Hostgator is a big name in web hosting worldwide. It is a hosting company from USA and now it has opened its offices and datacenters in India also. Their servers are quite fast and responsive and support is top notch. Without any doubt it is one the best web hosting you can find in India. They offer shared hosting, reseller hosting, vps hosting, dedicated servers. Their prices are a bit on the higher but their service and support is very good and they do offer special discounts from time to time. Indian payments options are available like Netbanking, debit card etc. GoDaddy is the biggest name in Domain Registration but now they are providing web hosting too for their customers. They are relatively new to hosting arena but their prices are lower than the hostgator. They do provide payment options like netbanking, debit card for the Indian customers.